1. Cook the potatoes in a pan of boiling water for 20 minutes, until tender, adding the beans 5 minutes before the end of the cooking time. Drain, refresh under cold running water for a few moments, then drain well and set aside. 2. Whisk together the dressing ingredients, then season (use a splash of water to loosen the consistency, if needed). Arrange the watercress on a serving plate (or in a large picnic container) along with the potatoes, beans, tomatoes and salad onions. 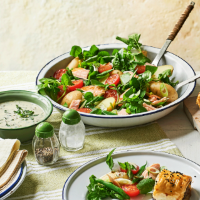 Flake over the salmon, then spoon over the dressing just before serving. This recipe was first published in Thu May 31 13:51:52 BST 2018.